Daesh terrorists released from Raqqa by the terrorist PKK-linked People's Protection Forces (YPG) were reserved to fight against Turkey, President Recep Tayyip Erdoğan said Wednesday. "It is alleged that the YPG terrorist group has released Daesh members to fight against us. What difference does that make? They are all the same. They are terror groups that have assumed different roles in the same scenario," Erdoğan said. The president added that Daesh terrorists who were besieged and could have been easily destroyed in Raqqa were taken out and spread to other regions across Syria, with some of them kept in reserve for possible action against Turkey. Erdoğan stressed that Operation Olive Branch in northern Syria's Afrin also aims to eradicate some of this Daesh reserve. According to Erdoğan, some 268 terrorists have been killed over the past four days in Operation Olive Branch, while the Turkish army and FSA had seven to eight martyrs. 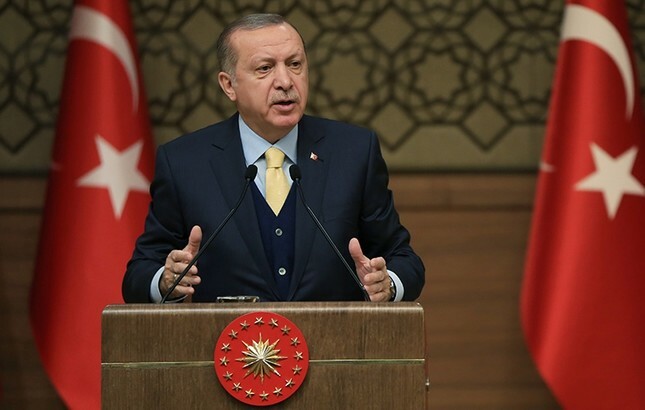 "Turkey will first exterminate the terrorists in Afrin and then make the region livable again, all for the 3.5 million Syrians we are currently hosting," he said, adding that the region was getting under control step-by-step. Erdoğan also criticized former U.S. president Barack Obama for violating trust, saying Turkey had a planned operation named "Olive Grove" to clear Manbij area of terrorists. Obama, however, prevented it from starting, promising to drive the YPG terrorists east of Euphrates since 95 percent of Manbij inhabitants are Arabs, but he "did not keep his word," the president added. Operation Olive Branch was launched Saturday, targeting the PKK terror group's Syrian affiliates the Democratic Union Party (PYD) and its armed wing People's Protection Units (YPG) as well as the remaining Daesh elements in the Afrin region on Turkish-Syrian border.